HP Sleekbook 14 is a sleek, thin, and light weight Windows 8 laptop. It offers a brilliant 14-inch HD LED display. A couple of models of the HP Sleekbook 14 are now available in Nigeria. You can buy the Sleekbook 14 at computer stores as well as Online Stores in Nigeria. HP Pavilion Sleekbook 14 a sleek laptop. It is just around 21mm thick and models in the line can weigh as low as 1.8kg. It is important to note that the HP Sleekbook 14 is not one laptop, but a laptop line. So, depending on configuration, the Sleekbook 14 can vary in processor power, on-board RAM, internal storage, and other features. For example the HP Sleekbook 14 B001eia (which may come with the model No C5R80EA) comes with a 1.8GHz i3 core processor with turbo boost technology for up to 2.6GHz clock speed. It also comes with 4GB RAM, 500GB HDD, and multi-touch touchpad. Other HP Sleekbook 14 may come with a different processor, more or less RAM, etc. My point is, although they may all look alike, inside they may be different. All HP Sleekbook 14 models feature 14-inch LED display, full QWERTY keyboard, Windows 8 OS, HD Webcam. It may come with an Intel core i3 or core i5 processor. Cheaper HP Sleekbook 14 laptops may also offer AMD A-series processors. Need more information read our HP Sleekbook 14 article. 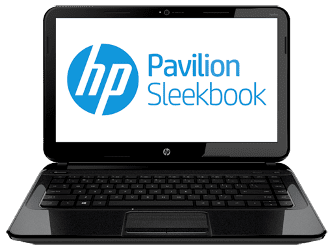 You can buy HP Sleekbook 14 online or from leading computer stores in Nigeria. The Price of the HP Sleekbook 14 in Nigeria starts from N110,000. Cheaper models may also be available. Make sure to confirm the specs at the store.